This post will hopefully mark the resurrection and continuation of My week in Film… (though this new instalment technically covers a selection over two weeks) after a lengthy hiatus due to my day job as a Festival/Programme Coordinator. Inevitably when working for a film festival the only films I’m able to see are those in the programme, however due to the month-long nature of AV Festival (my current gig), and an average schedule of one film per day, I did manage to see Under the Skin (Jonathan Glazer) and The Grand Budapest Hotel (Wes Anderson). With Glazer’s unnerving film I was equally impressed and irked by the melding of documentary style shooting and stylistic, art-horror sequences, not to mention a fantastic performance by Scarlett Johansson, whilst Anderson’s latest film was simply joyous, perhaps closest to Fantastic Mr Fox in tone and noticeably more vicious (Goldblum’s fingers!) than previous offerings. Attempting to catch-up with current releases, I saw the much-hyped Calvary in which, following The Guard in 2011, Brendan Gleeson again brings his considerable charisma to the central role for writer/director John Michael McDonagh. That the film is an allegory is clear, and the attempt to approach the subject of the Catholic church’s culpability and guilt with the director’s characteristic dark wit is engaging and entertaining, but I couldn’t forgive what amounted to a cast of caricatures in place of real characters, and a self-awareness in the dialogue that was outright smug. For a well-balanced review, see Donald Clarke in the Irish Times. 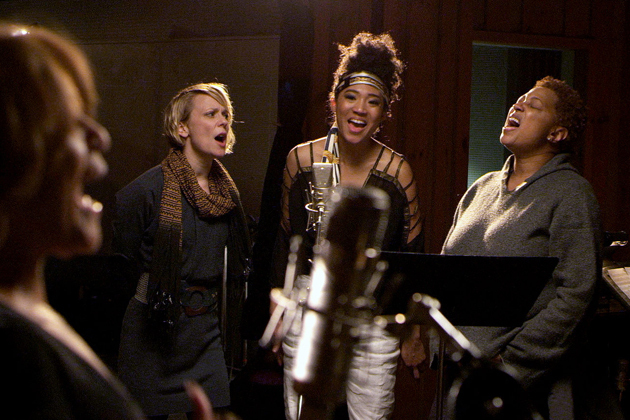 20 Feet From Stardom (Morgan Neville, 2013) was everything I expected from this Oscar winning documentary – an all-star cast of contributors including Mick Jagger, Stevie Wonder, Bette Midler and Bruce Springsteen, singing the praises of the backing singers who brought depth and soul to their recordings from the 1960s to the present. Slickly edited with a strong focus on showcasing the very talent that normally goes unnoticed, what is so enthralling about the lives of these singers – including Darlene Love, Merry Clayton, Lisa Fischer and The Waters – is hearing of their less-successful solo careers and the suggestion that despite their raw talent, what prevented them from becoming ‘stars’ was sometimes their lacking in the ability to self-promote, to perhaps take on the role of the exhibitionist that seemed to come so naturally to performers like Tina Turner or The Rolling Stones. For Táta Vega, there could only be one Aretha, no matter how often her substantial talent was compared to the legendary soul singer. The film undoubtedly provides the recognition these singers deserve, revealing one astonishing performance after another, that will surely change the way we listen to songs like Gimme Shelter or Young Americans forever. Finally I saw Richard Ayoade’s The Double, an adaptation of Fyodor Dostoevsky’s novella of the same name, which sees Jessie Eisenberg play a man named Simon James – a person infuriatingly incapable of even the simplest of human interactions – whose life is irrevocably harassed by the presence of his doppelganger, James Simon. Ayoade and co-writer Avi Korine create a distinctly desperate world for their protagonist, whilst Andrew Hewitt’s score provides a perfect prickliness to compliment Simon’s drab environment. Perhaps the most joyous part of Ayoade’s second feature is the fictional action sci-fi TV show seen on monitors littered throughout the otherwise grim world the characters inhabit. Appearing at crucial moments as if to antagonize Simon’s ineffectuality, Paddy Considine stars in a gleefully retro styled show called The Replicator, in a nod to Ayoade’s involvement as writer/actor in Garth Marenghi’s Darkplace (2004) which also provides perhaps the perfect continuation of Considine’s performance as a ‘psychic’ alpha male, would-be home wrecker in Submarine. Also viewed: Celluloid Man (Shivendra Singh Dungarpoor, 2012), full review here, the glorious Frances Ha (Noah Baumbach, 2013) – just as good on second viewing, Say Anything (Cameron Crowe, 1989) – in which, though it makes obvious why John Cusack became such a big star, is actually a rather baffling film, switching from tender youthful romance to high-stakes crime dad, fear of flying awfulness. Finally the past fortnight also saw me revisit Jean Renoir’s La Règle de Jeu (The Rules of the Game, 1939), which is still just a remarkable film.